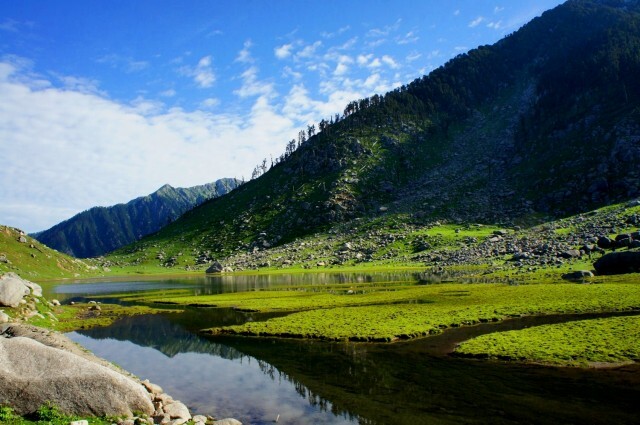 Kareri Lake (also known as Kumarwah Lake) is a high altitude, shallow, fresh water lake south of the Dhauladhar range approximately 9 km North West of Dharamsala in Kangra district Himachal Pradesh. Kareri lake is best known for being a trekking destination in the Dhauladhars. The lake remains frozen from early December to March–April.There is a temple dedicated to Lord Shiva and Shakti on a hilltop overlooking the lake. Most people who visit Kareri stay overnight in preparation for the hike to Kareri lake and there is a lot one can explore from this campsite if time permits. Overall, this is an ideal Himalayan trek that can be wrapped up over a weekend. Call us to pre-book for special offers and packages.